If you were creating some of the most spectacular and enjoyable scenery on earth, and you had unlimited time and resources, you would probably come up with something very much like Zions. It is so beautiful, just to describe it in words is a cliche. 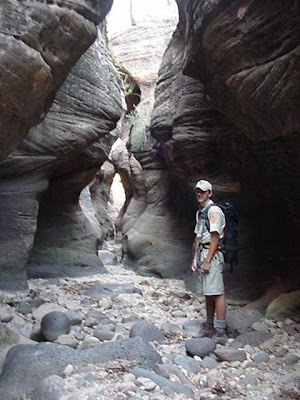 Take the hike upstream from the canyon, and as it , and you encounter the Narrows -- an amazing labyrinth of twists and turns as the upper reaches of the Virgin River climb higher onto the Kapirowits Plateau. As with all canyon hikes, be mindful of frigid water, keeper potholes, and flash flooding with no advance notice flushing through. Other hikes of note -- and notorious -- include many nearly subterranean adventures through slot canyons, like the famous Subway, pictured here. The Subway is reached via the Wildcat Canyon Trailhead on the highway northeast of the town of Virgin. 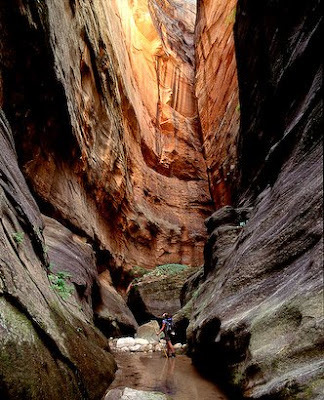 Here is another photo of a Zions backcountry destination -- Orderville Canyon. It must be seen to be appreciated. Nothing less than eyes on can convey the scope and breadth of majestic sculpture in these massive canyons. It looks beautiful! I'd love to go someday! Okay, c'mon and I'll go with! Brian and I hiked the narrows a couple of summers ago, it was AMAZING!